I’m not lying when I say that I was totally surprised yesterday when I bit into a small cupcake from a hospital cafeteria. I wasn’t expecting much, especially after my 7 Eleven experience (see my post below, from 7/11/11), but it was actually really good. Here’s the story: Fellow Cupcake Crusader, Jenn, had her baby yesterday at GMBC hospital. Which meant that I spent over 12 hours at the hospital waiting for the baby to join this world. Around 11am I decided to go to the cafeteria to get some lunch. I spotted the cupcakes then and thought to myself, “No, don’t do it. You will regret it.” But as I sat there, waiting, my curiosity wouldn’t let me forget that they were up there. Waiting to be tried. Then, around 2pm I went back up to the cafeteria with my dad. I had told him about my curiosity with the cupcake, and being a supportive father of my cupcake craziness, he bought it for me. I wasn’t really hungry right away so I waited until about 6pm to finally dive in. I couldn’t believe how good it actually was! I mean, don’t get me wrong, I’ve had better cupcakes before, but the cake was very moist (more dense than I typically prefer though) and the frosting was a combination of really sweet (the orange flower) and just mildly sweet with a hint of lemon flavor (white frosting base). I wasn’t expecting this to be a cupcake that I took more than one bite of, but I happily ate the entire thing. I’d have to say yesterday was a good day. Healthy baby girl. And a tasty treat. 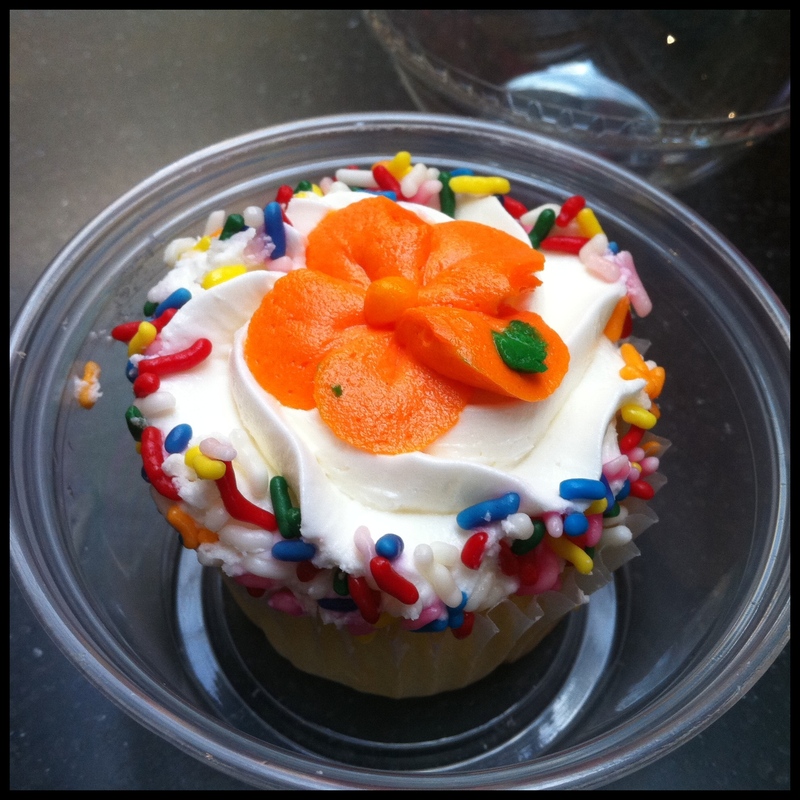 This entry was posted in Baltimore, Cupcakes, Maryland and tagged Cupcake, GBMC, vanilla by Stacy. Bookmark the permalink.